NextIs Simplicity the Antidote to Complexity? John Maeda’s 4th Law of Simplicity states: “knowledge makes everything simpler”. In this post I lay out why this might be only partly correct, suggest that there are problems where this works better than other and illustrate how knowledge can also make things more complex, rather than simple. Today I continue to look at the concept of simplicity and its relationship to complexity by focusing on the work of John Maeda, designer, artist and president of the Rhode Island School of Design. Maeda has devoted much of his career to understanding the role of simplicity in art, design, business, technology and everyday living and his book, The Laws of Simplicity, may be the most cogent analysis of simplicity in a manner that adheres to the very laws it espouses. As a designer, academic, and innovator, Maeda’s interest in simplicity reaches to the core of his craft and because of this, his work on the subject is worth paying attention to. The Laws of Simplicity outline 10 laws, of which most I agree with. However, there are three that I see as problematic and, in some cases, actually inspire greater complexity rather than reveal or produce simplicity. I begin with Law #4: “knowledge makes everything simpler”. In the fourth law, Maeda argues that simple things often require knowledge to fully unlock their potential. One of the examples he gives is the screwdriver and the screw. Two simple things, but it requires knowledge of how they fit together and which way to use them through such mnemonic devices like “righty tighty, lefty loosy” to make the simplicity work (p.33). Using the examples of learners tackling new and difficult problems, Maeda discusses how the development and application of knowledge creates opportunities to create simple solutions by understanding the basics relative to the more complex parts — something systems thinkers might consider relating the entire system to the components within it. Using the screwdriver example, this law becomes quite evident and could easily be supported. However, to use tools like screwdrivers as the metaphor, there are problems that require many tools working at the same time to solving them. It is here that a little information helps to a point, but then as starts to fall back on itself because the volume of knowledge required to fully understand things gets too much. In complexity terms, this is where interactions and feedback enter and the previously independent points of knowledge converge, requiring someone to attend to multiple things at the same time. As the metaphor goes, the vise, the saw, the planer, the drill and the screwdriver all need to be thought of at the same time in order to solve the problem. New mnemonics or “simple rules” need to be found. If we surmise that complex information is more difficult to fully comprehend than something simple, then the likelihood of a message being understood goes up if it has greater simplicity than complexity. If we consider knowledge as being the understanding of information, then we can conclude that more information equals more knowledge. 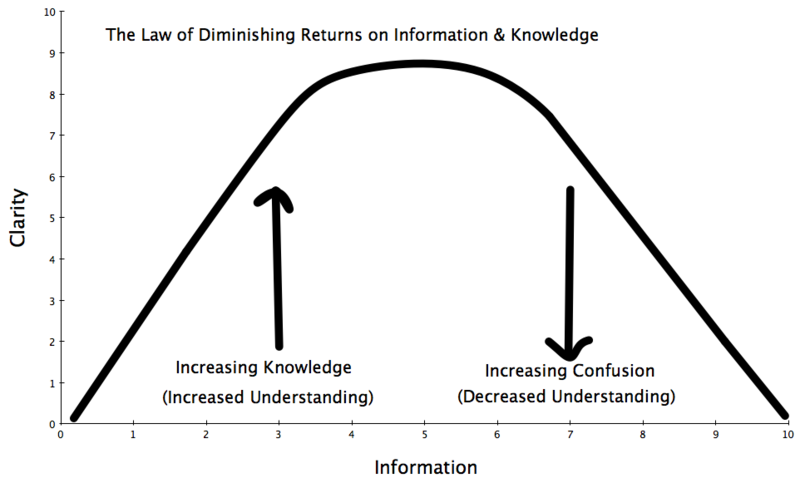 In the diagram, there is a steady increase in the amount of clarity that knowledge provides up to a point where it levels off and then, as information increases, the complexity rises and the confusion grows. At some point, the information and knowledge load becomes too large for the problem and the simplicity starts becoming complex. This I describe as a law unto itself, because I have yet to find an issue where this doesn’t apply. Edmunds and Morris (2000) looked at this phenomenon in a review of the literature published in the International Journal of Information Management, concluding that information overload is a serious problem for organizations and the individuals within them. To illustrate this problem of knowledge and simplicity, consider a socially conscious trip to your average North American grocery store. I love food and want to eat in a manner that is healthy, ethical and environmentally and economically sustainable. As a result, I devote a lot of time to researching food to find out what options are available to me. This knowledge has transformed something simple like buying groceries into an event of uncommon complexity (or joy into angst on some days). My knowledge of healthy eating means that foods with trans-fats, excess sodium and sugar, and high levels of carbohydrates, fats and calories are out. Add to that what I know about socially responsible farming and the environment, and I’ll try to choose products with less packaging, organically (and sustainably) grown, local (when appropriate), and those that use little harmful chemicals that unnecessarily damage the environment and the creatures within it. I also want my food to be of good quality (fresh) and good value (which often means low cost). Each one of these issues — healthy vs. not, organic vs. not, expensive vs. cheap — are issues where some more information can lead to making the decision simpler. Multiplied together, and this becomes complex. Simplicity, to me, is to reduce a complex environment to its key drivers. Every (complex) system is made up of variable parts and relationships between them. Our understanding of the system depends on where we are and how we see the World. Simplicity means ignoring the things that do not matter (much) in our “model” (another loaded word) of the system and focusing on what is key. That often requires analytical and/or conceptual skills and is more and more important in our society, as we strive to find guidance in the increasingly complex world that surrounds us. Bernard, I think your focus on the things that matter are important within complex systems and help us avoid paralysis when there is too much going on or going in too many directions at the same time. We get trained and educated to primarily deal with simple or complicated problems, rarely the kind that are complex or chaotic (see Snowden’s Cynefin Framework for more on this) . The focus on what is ‘key’ is important, but only if you are able to determine what is key. To this end, I’d add to your list of competencies a clear sense of values and goal clarification such as: what specific outcomes are you looking for and what means of getting there are acceptable? Is Simplicity the Antidote to Complexity?